Last night was cold and clear so I finally got outside to do some astrophotography with my telescope. Saturn is a great target this month. The image above is a composite of about 20 images from a quicktime movie captured with a the Phillips SPC900NC web camera I got for my birthday. I stacked and averaged the images to bring out detail. This was my first attempt. Ideally, once I get the hang of this I'll stack about 200 frames to make final images which should give me greater detail than this. Through the scope with my eyes I could clearly make out the cassini division which isn't visible in the photo. I'm guessing this may be a focusing issue. It is extremely difficult to focus the image and the cold wears my patience thin. Look forward to better images this spring. 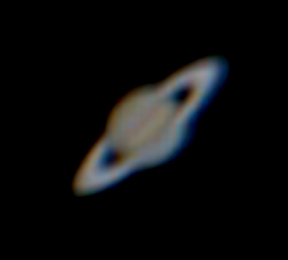 I hope you enjoy my first attempt at photographing the ringed planet!